2018 Night of Stars, celebrates the triumphs of youth experiencing homelessness who are now on their way to stability, featuring musical selections by Grammy Award Winner Yolanda Adams. Washington, DC – Thursday, June 7, 2018 – Covenant House Greater Washington host their Night of Stars Benefit Gala, celebrating 23 years of providing wrap-around supportive services to youth experiencing homelessness, disconnection, and exploitation. Each year the evening brings together leaders immersed in moving the needle to end youth homelessness in the Greater Washington region while honoring those who have made a significant financial, or volunteer impact to work done at CHGW. This year, CHGW has helped 90 percent of their homeless population in transitional housing reach stability. “We define stability as a young person who reaches a point where they have achieved educational or trade credentials, successfully obtained employment, and have stable housing,” says Covenant House Washington’s CEO, Dr. Madye Henson. CHGW offers all the programs needed to help young people reach stability including housing, workforce readiness, post-secondary education support, high school diploma and GED courses, and drop-in-services which include a food pantry, clothing donations store, and Child Development Center. CHGW launched their Hospitality Institute with a 95 percent completion rate helping youth achieve career opportunities in hospitality “the fastest growing industry in Washington, DC” says Thomas Penny, President of Donohoe Hospitality. This year will feature musical selections by Grammy Award Winner, Yolanda Adams, a special appearance by Washington Redskins, Robert Kelley, and NBC4’s Aaron Gilchrist will serve as the Master of Ceremonies. 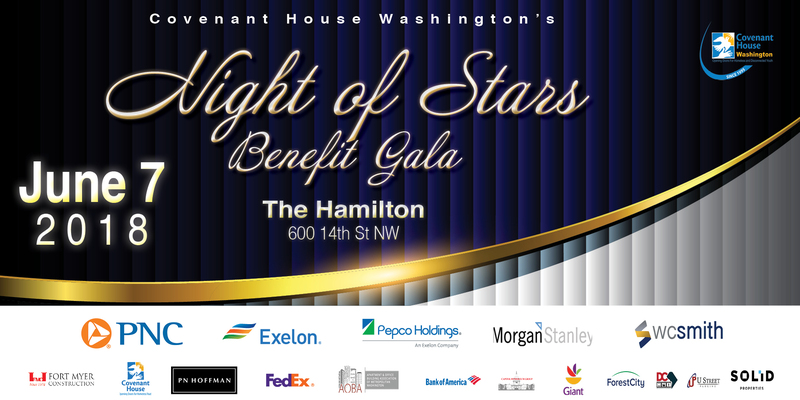 Night of Stars will take place at The Hamilton located at 601 14th NW Washington, DC. Covenant House Greater Washington serves as the premier non-profit in supporting youth ages 18-24 experiencing homelessness, disconnection, and exploitation in the Greater Washington region. CHGW’s vision is to help young people achieve stability upon completing their wrap-around supportive services. These supportive programs and services include seven housing facility, workforce readiness, job and career placement, financial literacy, post-secondary education support, high school diploma and GED courses, case management and drop-in-services including a food pantry, donations clothing store, and a Child Development Center.